Should You Bang or Honk to Save Cats Sleeping on Tires? 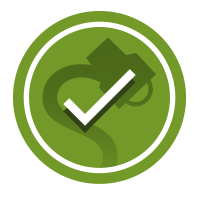 Rumor: Drivers should bang on the hood or honk in cold temperatures to rouse cats who may have fallen asleep in wheel wells or elsewhere under a car. Cats have been gravely injured or killed after seeking warmth by hiding in wheel wells or under cars. 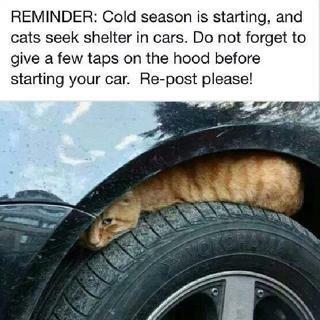 Every year when the weather gets colder, I see a warning go out to bang the hood of your car before starting up, as cats may have curled up on top of your tires, or crawled under your car or into your engine for warmth. The noise on the hood is supposed to startle them into vacating your engine. My thought is that if the cat doesn't move from the door slamming, or from the engine starting and you pulling away, he's probably pretty far gone anyway, but my friend tells me that the problem is when they're curled around the engine, and half frozen, which reduces reaction times ... the slamming door may not be enough, and "many cats die this way every year". Do cats actually crawl into engines; are there documented cases of them getting caught in starting engines; does banging on the hood actually reduce the risk of you killing a cat when you start your car? Social media sites like Facebook have hastened the circulation of warnings about the safety of animals. Such is the case with a common caution to “bang on the hood” of a car or honk in the winter to alert cats who may have taken shelter atop tires or in other concealed places. According to the warnings, many cats who spend all or some of their time outside are killed or injured critically every year after having fallen asleep in or around the cars of unsuspecting motorists, particularly in colder weather. Cats seeking warmth have been known to crawl into engine compartments in cars that have recently been driven. This can be fatal to the cat if the car is started. Block off access to the garage. If you suspect a cat could get under the car, honk the horn or bang loudly on the hood before starting the engine. This should wake up the animal and give it a chance to escape or let you know it’s there, in which case you can pop the hood and let it out. From mid-May to June – kittens are born and often escape. Each season Animal Services in Palo Alto responds to about 20 calls like Gigi’s, Urbanski said, and in about half the cases, the cats end up dying. Ultimately, cats can and do seek shelter in and around vehicles for warmth and some are injured or even killed when drivers fail to notice their presence. Banging on the hood or honking the horn can wake a sleeping cat and prevent this from occurring, but sheltering cats indoors is the best way to keep them safe from vehicle dangers. The Capital Times. 10 December 2009. KNTV [San Jose]. 18 June 2013.